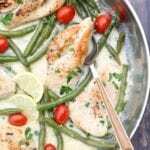 Chicken Breast with String Green Beans and Tomatoes in a Creamy Garlic Wine Sauce! Quick and Easy Dinner Recipe Ready in 30 Minutes! Add green beans to saucepan and cover with water. Cook until desired tenderness is reached, about 5 minutes. Cut each chicken breast in half lengthwise, you will have six cutlets. Season each side of cutlets with salt and pepper to taste. Add oil to skillet, cook chicken 3-4 minutes on each side, until thoroughly cooked. Remove chicken. (*See note). In the same skillet, add the butter and minced garlic, cook 1 minute on medium heat, add flour and mix vigorously. Continue mixing and add wine, lemon juice, chicken broth, heavy whipping cream and tomatoes. Simmer 1 minute. Drain green beans and add to skillet. Add chicken cutlets back to skillet. Simmer until sauce starts to slightly thicken, 2 – 3 minutes. Garnish with your favorite herbs, serve. Enjoy. So easy. Note: If you want your chicken really tender, once chicken is fully cooked, turn heat down to low and let it continue cooking covered until chicken becomes tender (about 10 minutes). This is optional.